In recent times, animal nutrition has assumed a role far bigger than anticipated – a factor that has accelerated animal feed additives industry. Consumers across the globe have lately developed a palate for protein pertaining to a slew of related determinants, such as increased awareness with regards to health, the role of proteins & other nutrients in augmenting immunity, a change of lifestyle standards, and rising disposable incomes. On these grounds, the consumption of milk and meat has observed an incline, which has indirectly paved the way for the development of animal feed additives market. As cited by WHO, the annual meat production is anticipated to surpass 376 million tons by 2030 from 218 million tons in 1999. These statistics demonstrate the increasing pressure for livestock breeding to meet the rising demand for high-value animal protein, which has notably uplifted the global animal feed additives industry share. Global livestock sector is growing at an unprecedented rate with the remarkable increase in the consumption of animal products in the developing countries. Surprisingly, a strong relationship has been observed between income levels and the consumption of animal protein. The recent decline in the prices of meat, egg, milk, especially in the developing countries have led to an even higher rate of meat consumption in these regions than the industrialized countries. To be precise, in 2014 the meat production & consumption in Asia Pacific, led by China, Thailand, and India accounted for more than 40% of the overall animal feed additives industry share. While for the same year, Europe and North America animal feed additives market share accounted for 17% and 13% respectively. In terms of meat consumption, China stands at the helm, where a person on an average, consumes 60 kg of meat on an annual basis. As per estimates, the meat consumption in China is further expected to reach up to 85 kg by 2024. This denotes the significant upliftment of global animal feed additives industry, that can be attributed to raising the livestock population to meet the growing demand for meat and dairy products. Indeed, there is sufficient data to support the growing trends of animal feed nutrition growth. The results obtained from a report published by Global Market Insights, Inc., claim animal feed additives market to raise its valuation to USD 22 billion by 2022, with an annual growth rate of 3.5% over 2015-2022. The nutritional requirement for farm animals with regards to protein, energy, vitamins, and minerals has been a well-known theory since long, and has also been implemented practically across most geographies, though a reclamation of sorts has been observed in recent times. Having adopted the increasingly popular approach of supplementing animals with proper nutrients, animal feed additives industry is gaining a lot of momentum in its product offering which includes all the elements necessary to raise healthy livestock. There are several types of feed additives catering to a host of nutritional needs, the vital ones being, acidifiers, minerals, enzymes, vitamins, and amino acids. Below mentioned is a brief synopsis of the major products driving animal feed additives market. Animal meat is one of the strongest protein sources, and the highest proportion of proteins can be found in the muscles of animals. Having recognized that protein deficiency is a major health issue, consumers have changed their dietary preferences to include protein-rich meat, eggs, etc., which has prompted animal feed additives market players to increase the proportion of protein in animal feed. Key protein additives including amino acids, lysine, methionine, tryptophan, and threonine are majorly used in animal feed. The overall demand for amino acids is particular notable, given that they are the building blocks of proteins. As per estimates, amino acids market from livestock applications is projected to collect revenue over USD 8 billion by 2022. Natural substitutes such as soybean are also gaining traction of late, as natural additives further elevate the demand for protein. Enzyme additives are essential supplements used in animal feed that help to break down the animal protein to amino acids. 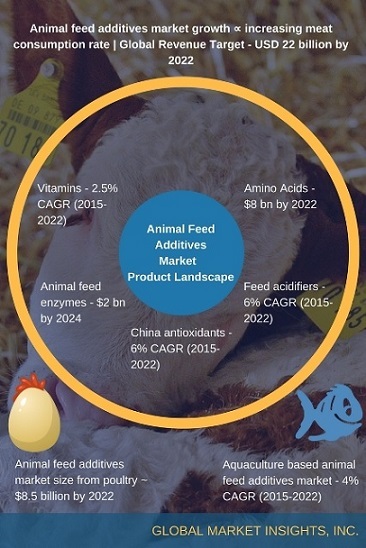 Animal feed enzymes market is a chief constitute of animal feed additives industry which is set to surpass 80 kilotons in terms of volume by 2024. Growing necessity to enhance animal health is poised to create ample demand for this product in animal feed. Protease and carbohydrase are two major types of enzymes which are included in poultry and pig fodder. The ever-rising demand for meat is thus set to have a substantial impact on enzyme requirement in animal feed additives industry. Trace minerals are very important elements, as mineral deficiencies can result in weight loss, poor reproductive traits, and poor feed efficiency. Thus, to prevent mineral deficits, minerals are included in animal feed rations to enhance the overall health of livestock and increase the gut absorption. The current scenario in animal feed additives industry is beholding the trend of using organic minerals in livestock feed that could assist in activating essential hormones and enzymes to promote healthy metabolism. Thus, animal feed organic trace minerals market is depicting a rather profitable growth at a CAGR of 6.5% over 2017-2024. Vitamins are the other set of vital nutrients in animal feed that help animals regulate their bodily functions. Vitamin-based animal feed additives market is projected to record a CAGR of more than 2.5% over 2015-2022, owing to rising demand for vitamin A, E, D, K and riboflavin in animal feed to markedly improve animal health. Globally, the per capita meat consumption surged from 41.3 kg in 2009 to 41.9 kg in 2010, and is projected to scale great over the coming years. The overall meat consumption will be majorly driven by poultry demand. Worldwide, pork is the most commonly consumed meat, followed by poultry, beef, and mutton. Global animal feed additives market is set to witness significant gains from poultry, as it is the fastest growing meat sector, which rose by 4.7 percent in 2010 to 98 million tons in terms of volume. South Asia and Sub-Saharan Africa are likely to witness a twofold demand for livestock products, from 200 kilocalories per day per person in 2000 to around 400 kilocalories in 2050. Over the years, even in livestock sector, consumers will prefer the ‘organic’ label, since pasture raised animals can be healthier and environmentally favorable. Regulatory bodies across the globe have mandated certain laws to standardize meat products and prevent the onset of livestock-related diseases such as bird flu & swine flu. This has significantly driven animal feed additives market as the antibiotics, antioxidants, and amino acids present in these products increases immunity level of animals, making them less vulnerable toward these ailments. However, due to public health concerns over the development of antibiotic products for resistance, antibiotics growth promoters (AGP) are getting very limited acceptance. In 2006, the EU banned the use of AGP for livestock and the U.S. government narrowed its deployment period until 31st December 2016. On account of such official bans on antibiotics used for growth promotion, animal feed additives industry players are focusing on the development of products based on natural plant extracts. These products are now being widely accepted by the regulatory bodies subject to the growing health consciousness. Anatara Lifesciences Ltd., for instance, has announced a partnership with Zoetis - a global player in animal feed additives market, to reduce the use of antibiotics in animal production. Anatara has developed a non-antibiotic and anti-infective product called Detach™, that is designed as an alternative to traditional antibiotics, and is gradually gaining traction in animal feed additives market. It can be concluded that the ongoing research activities regarding the use of antibiotics in animal feed additives industry have opened new doors of opportunities through which manufacturers can garner appreciable profits. Animal feed additives market is relatively consolidated, despite the industry having gained a remarkable momentum across the globe. As per statistics, the top industry participants account for 60% of the global animal feed additives industry share. The key companies in animal feed additives include BASF, Danisco, DSM, Novozymes, and Evonik Industries. The growing bans on antibiotics have encouraged these participants to invest in development of new technologies as the market is witnessing a steady shift from synthetic antibiotics to feed additives made from organic and natural ingredients. As the worldwide animal feed additives industry depicts continued consolidation, it has become vital for market players to find more efficient ways to capitalize on animal nutrition and consumer health.